Stoke’s Red and Dunkerton’s Late, on MM106. Send us an email if you want to reserve any of these for planting this Autumn. Last years cider apples came by the trailor load! Some of the small apple and plum trees i left in the field after i moved my nursery two years ago ( I move to a new patch every year), started to fruit this year in earnest. At the moment they have central leaders and i have the option of letting them branch out with 5 or 6 framework branches, and later cut out the leader to form open centred trees. This is an easy method of formative shaping to understand for amateurs and semi-professionals. However, with the advent of dwarfing rootstocks, in the early 1940’s in Germany, and later in Holland, the growing of high density spindlebushes was becoming of great interest to growers. We in the uk were still growing very large trees on M7 rootstocks at a very wide spacing, and it was only post – war visits to Germany which opened our eyes to developments there. Its similar to my cordon grown trees, in that it is all about having fruiting wood in abundance and basically nothing else! Those of you who have attended my workshops will be familiar with the need to identify fruiting wood. Very high rates of production per hectare. Small trees, enabling pruning, spraying and harvesting from the ground. Very efficient use of land and available sunshine. They are normally grown on very good land, and M9 rootstocks, a very dwarfing one. Basically, there is a central stem and lots of wee laterals to carry the fruiting buds. A tall thin pyramid is required. Thicker pencil sized laterals are cut back to 4 buds, anything thinner to 2 or 3 buds. Cut to downward facing buds always. So horizontal wood is the aim, use spacers if necessary. Unlike some methods I teach, this one requires very severe pruning. The leader is pruned – that is the new growth to 4 or 2 buds on a weak tree. The common mistakes are to not cutting back the leader hard enough and allowing too much fruit early on leading to stunting of shoots. The aim is to have lateral branches with lots of fruiting spurs and no gaps along the branches. (‘Lorette pruning’), or next winter if you forget! You can allow your laterals to branch to fill the space a little, such as if theres a gap in your tree you want to fill. Tie a higher one down to fill a space if necessary. Keep the pyramidal shape by pruning harder if necessary your top laterals. Each tree should yield 10 lbs of fruit by the 4th year. The original spacing recommended was 10 feet ( 3m) and 435 trees per acre. 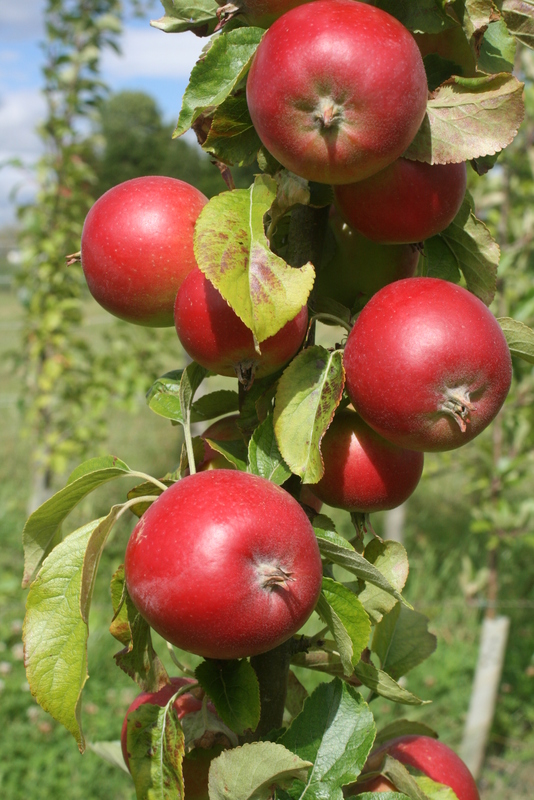 In you have an acre, you could be producing 4.3 tonnes of fruit by your 4th year! Using an m26 rootstock in most areas of Scotland, and tieing to stakes or wires in North-South lines is probably ideal. A modification is the Tall Spindle, which is allowed to grow to 3m and planted 1m x 3m spacings. It must have up to 10 short feathers ( branches) already from the nursery. Visit your nurseryman and select your trees personally! If you want to know more about pruning workshops, please see our google calendar on the website http://www.plantsandapples.co.uk. Golschmidt and Delap, The Spindle Bush Method of Growing Apple and Pear Trees, The RHS Fruit Yearbook, 1950, pages 54-66. The RHS Encyclopaedia of Gardening , ed C. Brickell, page 380.,1992. Many of you will be planting new fruit trees this spring and will be wondering what effect all the rain will have on your trees. At present your trees are dormant and most likely you are planting them as ‘bare root’. It is well known that up to 90% of your trees roots may be killed when they are lifted out of the nursery and replanted, so it is very important you keep the roots moist and frost free to preserve what’s alive. Tree roots need oxygen, and prolonged wet conditons will create anaerobic conditions and many more roots will suffocate. In spring, your trees will have a hard job growing new roots and getting the nutrients necessary to grow, flower and fruit. Another worry is a fungus disease called Phytophora or collar rot which can attack your trees in the summer after a very wet winter. So don’t exacerbate this situation avoid those wet hollows in your garden, don’t pile masses of compost around the roots, and look forward to a nice dry spring and summer! Also many beautiful productive fruit trees can blow over due to wet soil, so see to your drainage!